Cultural Arts Council Douglasville/Douglas County > Recent News > Programs > Family ArtsVentures! > Free Family Concert – Experience the Glass Harp! Free Family Concert – Experience the Glass Harp! The Cultural Arts Council Douglasville/Douglas County (CAC) presents its third concert of fall 2017 at Dog River Library on Saturday, October 7th at 10:30am. The featured musician, Brien Engel will introduce the Glass Harp and, the day before, will have performed two shows at Bill Arp Elementary School. This show is part of the CAC’s “Family ArtsVentures!” program that brings curricula-based performers into the schools, followed by free public shows for the whole family to enjoy together. So what is a glass harp? Musical Glasses, or the Glass Harp is a musical instrument that is a collection of drinking glasses, each chosen for their pitch or musical note. Glasses can also be tuned using water to obtain certain pitches. 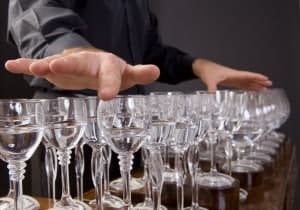 Glasses can be played by wetting ones fingers and carefully rubbing the rims of the glasses, using friction to make music. During the program Brien performs music of different styles and periods. The program explores musical instruments made from everyday materials, the history of glass and water-tuned music, and related concepts of physics and sound. Questions and song requests are welcome toward the end of the assembly. Brien has performed in schools, libraries, festivals, senior centers, colleges, appropriately in wineries, locally as well as internationally. 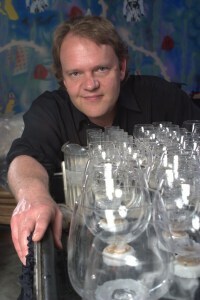 Brien Engel’s “Glass Harp” show starts at 10:30am at Dog River Library and lasts one hour and is free for all to attend. It is appropriate for all ages. For more information please Contact Us. “Family ArtsVentures!” are made possible with support from the Georgia Council for the Arts, GreyStone Power Foundation, and the Douglas County Board of Education.